Since the end of the Second World War, the United States has proven to be particularly prone to attacking other countries that have only limited capability to strike back. North Korea was the exception that proved the rule when the Chinese intervened to support its ally in 1950 to drive back and nearly destroy advancing U.S. forces. Otherwise, it has been a succession of Granada, Panama, Afghanistan, Iraq, Somalia, Serbia, and Libya, none of which had the capability to hit back against the United States and the American people. President Trump’s warning that he would annihilate Iran missed the point that Rouhani was offering peace and urging that both sides work to avoid war. The Administration has already announced that it will reinstate existing sanctions on Iran and will likely add some new ones as well. After November 4th, Washington will sanction any country that buys oil from Iran, markedly increasing the misery level for the Iranian people and putting pressure on its government. 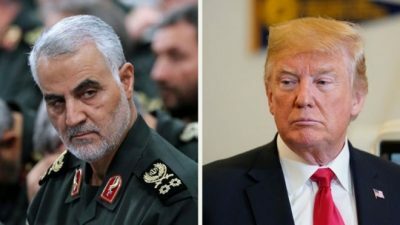 Iran’s Guards commanders have in the past threatened to target and destroy U.S. military bases across the Middle East, and also target Israel, within minutes of being attacked. Military targets would be defended by both Israeli and U.S. counter-missile batteries but civilian targets would be vulnerable, particularly if Hezbollah, with an estimated 100,000 rockets of various types, joins in the fighting from Lebanon. Washington argues that its pressure on Iran is intended to force its government to end its nuclear program as well as its support for militant groups in the Middle East, where Iran, so the claim goes, is engaged in proxy wars in both Yemen and Syria. The arguments are, however, largely fabrications as Iran has no nuclear weapons program and its engagement in Syria is by invitation of the legitimate government in Damascus while aid to Yemen’s Houthi’s is very limited. And there is no Iranian threat to the United States or to legitimate American interests. Given the size of Iran, its large population, and clear intention to resist any U.S. attack, military action against the country, which many in Washington now see as inevitable, would be by missiles and bombs from the air and sea. But it would not be a cakewalk. In the past year, Iran has deployed the effective Russian made SA-20c SAM mobile air defense units as well as the S-300 VM missile system, which together have a range of more than 100 miles that could cover the entire Persian Gulf. Radar has also been upgraded. They are the centerpieces of an air defense system that could prove formidable against attacking U.S. aircraft and incoming missiles while ballistic missiles in large numbers in the Iranian arsenal could cause major damage to U.S. bases, Israel, the Gulf States and Saudi Arabia. All of which means that Americans will die in a war with Iran, possibly in substantial numbers, and the threat by Iran to close the strategic Strait of Hormuz is no fantasy. It has threatened to do so if its own oil exports are blocked after November 4th, even if there is no war. And if there were war, even if subjected to sustained attack, Iran would be able to threaten ships trying to use the Strait with its numerous batteries of anti-ship missiles hidden along the country’s rough and mountainous coastline, to include the Russian made SS-N-22 Sunburn, which is the fastest and most effective ship killing missile in anyone’s arsenal. Fired in volleys, it would be able to overwhelm the defenses of U.S. warships, to include aircraft carriers, if they get too close. With the Strait closed in either scenario, oil prices would go up dramatically, damaging the economies of all the major industrialized nations, including the United States. A major war would also add trillions to the national debt. Iran also has other resources to strike back, including cadres ready and able to carry out terror attacks in the United States and Western Europe. American tourists in Europe will be particularly vulnerable. The reality is that the United States has no motive to go to war with Iran based on its own national interests but seems to be prepared to do so anyway under pressure from Israel and Saudi Arabia. If it does do so, Iran will certainly lose, but the damage to the United States at every level might possibly be very high.